The advert for our new Vicar has been published nationally in the Church Times and on the Diocese of Chester website. 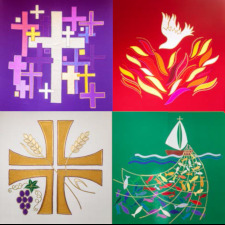 Applicants for our vacancy can find more about St Luke’s, our congregation and the opportunities and challenges for the next incumbent from our Parish Profile which is published on the Diocese of Chester website. 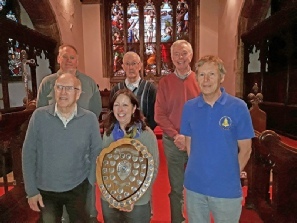 Congratulations to our team of bell ringers who were winners in the South Cheshire area ringing competition at St Leonard Warmingham on Saturday 16th March. The competition is to see which band can ring most accurately and keep best time over a period of about 5 minutes. They will now represent the area in the Cheshire competition later this year. Competition will be strong but we hope to do well. New ringers are always welcome (tuition given) so come along to one of our Friday evening practices. Details of those officiating at services during April 2019 can be downloaded here. The March meetings have now become the AGM when we deliver the accounts for the year and the annual report. In the afternoon meeting we read out the report of the year, with a variety of subjects such as George Martin who gave a lovely talk on Butterflies, Peter Cotton who came to talk to the group about St. Luke’s Church – a subject dear to us all – and Brian Stafford who talked about his hobby of gooseberries. After the report we looked at the financial accounts, which were quite straight forward. The ladies were treated to a lovely afternoon tea prepared with the help of Barbara Street and shortbread by Margaret Hardwick. This is always followed by interesting conversations between members, and often gives us ideas for future meetings. We have requested that part of the September meeting be dedicated to members’ ideas for future meetings, to give us some more variety and input. Many members also offer to help us doing particular jobs as they can see what hard work the committee put in throughout the year, but aren’t always able to commit themselves to being on the committee. It was an enjoyable afternoon and gives us time to talk to members in a social setting. Our next evening meeting is on Tuesday 9th April at 7.45pm in the Church Hall when Margaret Hardwick will give us a talk on the Joys of Gardening. Our next afternoon meeting will be on Wednesday 17th April at 2 pm at the Church Hall. It is entitled ‘Easter Thoughts’ so if any of you have any Easter thoughts, poems or reflections to share with us, please bring them along! If you are interested in joining us for either meeting please just come along to the Church Hall on the 17th, or ring me on 533882 or Dorothy on 533704. Look forward to seeing you there.